U.S. President Donald Trump says “we’re making tremendous progress” with North Korea, after an inter-Korean summit offered some apparent concessions from the North on its weapons program. Trump told reporters Wednesday that “we had very good news” out of the summit, where leader Kim Jong Un promised to dismantle a rocket launch site and also agreed to dismantle its main nuclear site if the U.S. takes unspecified corresponding measures. Trump didn’t indicate in his brief remarks whether the U.S. would be willing to take further steps to encourage North Korean action on denuclearization. However, he claimed credit for quelling the tensions that had escalated sharply during the first year of his presidency before his own summit with Kim in June. North Korea has conducted no nuclear and missile tests since late last year. China has welcomed the outcome of the inter-Korean summit and will continue supporting both sides in further talks on reducing tensions. Foreign Ministry spokesman Geng Shuang said Wednesday China noted the positive effects of the meeting on easing military tensions and promoting peace talks and the denuclearization process. China is North Korea’s most important ally and has long called on its fellow communist neighbor to work toward disarmament and turn its focus to economic development. China hosted long-stalled six-nation denuclearization talks and insists that its interests be respected in any long-term settlement. It has also strongly objected to South Korea’s deployment of an advanced U.S. missile defense system that bolsters Washington’s military presence in Northeast Asia, saying it threatens China’s security. Any move to reduce the North Korean missile threat may give it hope that the system could one day be removed. South Korean President Moon Jae-in and North Korean leader Kim Jong Un plan to visit a volcano sacred to the North on the last day of Moon’s visit. Moon’s office said Wednesday that Moon accepted Kim’s offer to visit Mount Paektu on Thursday. The volcano topped with a deep crater lake is at the heart of North Korea’s foundation mythology used to legitimize the Kim family’s dynastic rule. Members of the Kim family are referred to as sharing the “Paektu Bloodline.” The mountain on the North Korean-Chinese border is also emblazoned on the country’s national emblem and lends its name to everything from rockets to power stations. According to the official narrative, Kim Il Sung saved the Korean Peninsula with daring guerrilla raids against Japanese invaders from his base on the slopes of Paektu. South Korean historians say the tale is exaggerated. President Donald Trump is once again praising Kim Jong Un’s past agreements, but his late-night tweets didn’t address the U.S. matching North Korea’s moves. At a joint Korean summit Wednesday in Pyongyang, the North agreed to permanently dismantle a missile engine test site and a launch pad and to take further steps such as permanently dismantling its main Nyongbyon nuclear complex if the United States takes corresponding measures. North and South Korea have agreed to disarm a jointly controlled border village, starting with the removal of land mines. A joint statement signed by the countries’ military chiefs on Wednesday said the Koreas will aim to remove the mines in the Joint Security Area in the truce village of Panmunjom within October and also remove guard posts from the area. The statement says the Koreas agreed to jointly verify the results of such steps and also allow tourists and observers to move freely within the JSA. North and South Korea have agreed to make their first joint searches for the remains of their soldiers killed during the 1950-53 Korean War. A joint statement signed by their defense chiefs in Pyongyang on Wednesday says the Koreas will first remove land mines and other explosives in a central area of their border before starting the searches next April. It says the area they plan to search is where one of the fiercest battles happened during the war. The statement says the joint searches would be the first of their kind since the end of the Korean War. The statement was signed while the leaders of the two Koreas were present after their summit in Pyongyang. A joint statement says the two Koreas agreed to establish buffer zones along their land and sea borders to reduce military tensions and prevent accidental clashes. The statement signed by the countries’ defense chiefs also says the Koreas agreed to withdraw 11 guard posts from the Demilitarized Zone by December with the aim of removing them eventually. The statement says the Koreas also agreed to no-fly zone above the military demarcation line that bisects the two Koreas that will apply to planes, helicopters and drones. Seoul has been stressing the importance of reducing the conventional military threat between the Korea to prevent accidental clashes that can escalate into a nuclear conflict. The statement was issued following the Pyongyang summit between North Korean leader Kim Jong Un and South Korean President Moon Jae-in. South Korean President Moon Jae-in says the Koreas have agreed to establish a joint military committee to evaluate how to reduce tensions and maintain communication to defuse crises and prevent accidental clashes. Moon said Wednesday the plans for the committee are part of a commitment to remove “any threat that could cause war” on the Korean Peninsula. He was speaking following the Pyongyang summit with North Korean leader Kim Jong Un. Moon’s government has been stressing the importance of reducing the conventional military threat between the Korea to prevent accidental clashes that can escalate into a nuclear conflict. The Koreas first agreed to form a joint military committee in 1991, but the plans weren’t carried out due to turbulent relations between the rivals. A Joint statement says the two Koreas have agreed to seek to obtain the rights to co-host the 2032 Summer Olympics. The statement was released by Seoul on Wednesday after a Pyongyang summit between South Korean President Moon Jae-in and North Korean leader Kim Jong Un. It says the two leaders also agreed to cooperate in major sports events such as the 2020 Summer Olympics. It didn’t elaborate. It says the two leaders have also agreed on a Pyongyang art troupe visiting Seoul for performances in October. South Korean President Moon Jae-in is in Pyongyang this week for a summit with Kim. South Korean media pool footage show Moon told reporters Wednesday that Kim could visit Seoul this year. If realized, he would be the first North Korean leader to visit Seoul since the peninsula was divided into North and South at the end of World War II in 1945. Kim’s late father, Kim Jong Il, had promised reciprocal visits when South Korean leaders visited him in Pyongyang in 2000 and 2007. But his Seoul trip wasn’t realized before his 2011 death. South Korean President Moon Jae-in says North Korean leader Kim Jong Un has agreed to permanently dismantle a missile engine test site and a launch pad in the presence of international experts in what he described as a specific step toward denuclearization. Moon also said on Wednesday that the North agreed to take further steps such as permanently dismantling its main Nyongbyon nuclear complex if the United States takes corresponding measures. Moon and Kim spoke at a news conference after signing a joint statement following their second day of summit talks in Pyongyang. The leaders of the two Koreas have signed a joint statement after their summit talks, but no details of what it said were released. South Korean media pool footage shows South Korean President Moon Jae-in and North Korean leader Kim Jong Un signing the documents in Pyongyang on Wednesday. The leaders posed for photos while displaying the documents. Seoul says the two Koreans leaders are to jointly announce the results of their summit later Wednesday. The defense chiefs of the two Koreas also signed their agreements that Seoul says are about reducing military tensions along the border. North Korean leader Kim Jong Un and South Korean President Moon Jae-in have started their second day of summit talks in Pyongyang over the nuclear standoff and other inter-Korean issues. Moon and Kim on Wednesday were seen talking as they stepped into a meeting room at Pyongyang’s Paekhwawon State Guesthouse. They were accompanied by their wives and top government officials, including Moon’s national security adviser Chung Eui-yong and Kim’s sister, Kim Yo Jong, who is seen as Kim’s closest confident and possibly the second-most powerful figure in his ruling regime. Moon and Kim were expected to release a joint statement later on Wednesday. North Korea’s state media says there was an “in-depth exchange of opinions on various issues” between the leaders during their first talks on Tuesday. South Korea says President Moon Jae-in will attend a performance of North Korea’s iconic mass games following his second day of summit talks with North Korean leader Kim Jong Un in Pyongyang. Moon’s spokesman Yoon Young-chan said Wednesday he couldn’t confirm whether Kim will also attend the evening performance at Pyongyang’s May Day Stadium of tens of thousands of people working in unison. Yoon says the performance of “The Glorious Country” will draw about 150,000 spectators. Yoon says the Korean leaders will likely announce a joint statement following their summit talks earlier on Wednesday but will probably not take questions from reporters. North Korea first staged its mass games in 2002, when Kim’s father, Kim Jong Il, was the country’s leader. They continued almost without interruption on an annual basis until 2014, when they were not held at all. The North brought back the mass games during its lavish celebrations for the 70th anniversary of its state founding earlier this month. North Korean leader Kim Jong Un says his June summit with U.S. President Donald Trump has stabilized the regional security situation. South Korean media pool reports say Kim made the comment during a meeting with South Korean President Moon Jae-in. The reports say Kim thanked Moon for brokering his summit with Trump in Singapore. The leaders of the two Koreas had their first in-depth talks in Pyongyang on Tuesday. The talks are to continue Wednesday and Moon is expected to return to Seoul on Thursday. The leaders of the two Koreas have begun their summit talks on denuclearization of the Korean Peninsula and other issues. South Korean President Moon Jae-in flew to Pyongyang, North Korea’s capital, on Tuesday for his third summit of the year with North Korean leader Kim Jong Un. Moon’s office says the talks with Kim began at a ruling Workers’ Party building in Pyongyang. It says two senior officials from both countries are also attending the meeting with the leaders. Moon and Kim are to meet again on Wednesday. Moon’s office says the summit will focus on how to achieve denuclearization, reduce military tensions between the Koreas and promote ties. Britain’s top diplomat says it’s time for North Korea to take concrete actions toward eliminating its nuclear weapons. He spoke as South Korean President Moon Jae-in was visiting Pyongyang to meet North Korean leader Kim Jong Un to try to revitalize the North’s denuclearization talks with the United States. Hunt told The Associated Press that Britain is ready to relax economic sanctions on North Korea when there is concrete evidence of a change from the North Korean side. He is in Japan to hold “strategic dialogue” talks with Japanese Foreign Minister Taro Kono. North Korean leader Kim Jong Un and South Korean President Moon Jae-in are holding a car parade along Pyongyang streets. The recorded South Korean media pool footage showed the two leaders aboard a convertible black limousine smiling and waving their hands as residents, many wearing colorful traditional handbook dresses, chanted and waved plastic flowers. A convoy of sedans and motorcycles were the only other cars on the neatly manicured route. Moon arrived Tuesday morning for a three-day visit. They’re holding their third summit and will attempt to improve ties and resolve a standoff in nuclear disarmament talks. North Korean leader Kim Jong Un and South Korean President Moon Jae-in have arrived at a guesthouse in Pyongyang where they are expected to have talks over lunch. Kim and Moon arrived at the Paekhwawon State Guesthouse in a black Mercedes convertible and were seen talking and adjusting their hair before stepping out of the backseat. Their wives also reportedly shared a separate vehicle to the guesthouse. The Paekwawon Guesthouse was also where former South Korean Presidents Kim Dae-jung and Roh Moo-hyun stayed during their summits with Kim’s father in 2000 and 2007. North Korean leader Kim Jong Un has greeted South Korean President Moon Jae-in upon his arrival in Pyongyang for their third summit this year to improve ties and help resolve the nuclear standoff. 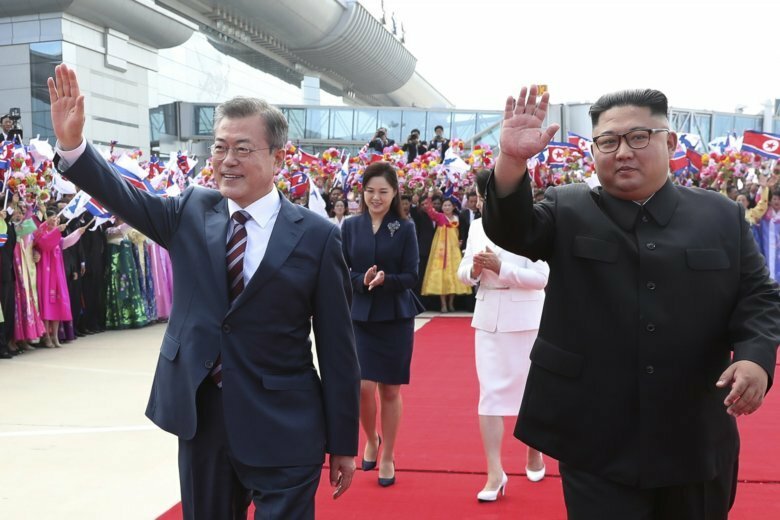 Moon and Kim embraced at the Sunan International Airport on Tuesday as thousands of North Koreans cheered and waved flowers, North Korean flags and a blue-and-white map symbolizing a unified peninsula. Moon and Kim and their wives shook the hands of North Korean and South Korean officials before they were saluted by a North Korean ceremonial guard. They then inspected goose-stepping soldiers, and Moon shook hands with North Korean civilians and bowed deeply to them.